From the day Steve Colgate opened his first school in Manhattan in 1964, he has insisted on sailing instructors with true teaching skills, keen sailing knowledge and extensive sailing experience in small and large cruising and racing boats. Offshore Sailing School instructors are men and women chosen for all of the above, plus humility, patience, dedication to you (our clients) and loyalty to Offshore Sailing School (the company). Here are the special people that deliver “exceeded my expectations” comments on almost every evaluation we receive back from our clients. If you would like to join our faculty, please see Employment Opportunities. 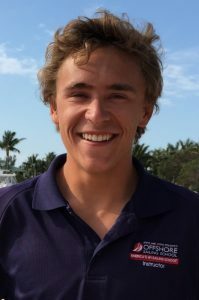 Hunter joined the Offshore Sailing School team in late 2017 when he sailed his Catalina 470 to Florida from Long Island, New York. 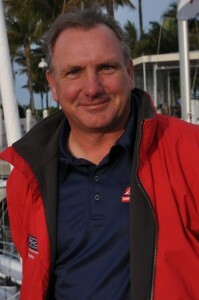 He is a US sailing certified instructor, and has been a USCG licensed captain for over 14 years. For more than 30 years Hunter sailed up and down the east coast from the islands to Maine, made numerous deliveries from the Caribbean, Bermuda and Chesapeake logging over 20,000 miles over the years. He has owned sailboats since 1984 when he bought the 19’ Cape Dory Typhoon and currently lives aboard his Catalina 470. Hunter served in the US Navy as a operating engineer with two tours in the Middle East, South America, Europe and Africa, and first sailed while stationed in Charleston, SC where he raced Hobie Cats. When discharged from the Navy, Hunter returned to New York and became a Master Plumber, running his family business for over 38 years. As a mechanic by trade he maintains his own boat while helping others. Hunter is now dedicated to living and teaching his true passion, sailing. Hunter’s wife, Maryann, is a licensed RN who is moving to Florida where to settle into a warmer climate and new lifestyle. Their daughter Maryanna Mae is studying environmental science and marine biology at Florida Southern University. Randon is from Houston, Texas where he learned to sail at age 12 in the local lakes and the Gulf of Mexico. Being an avid sailor at age 16 he became certified in Keelboats and Cruising and holds US Sailing instructor certification through passage making. He currently holds his USCG 6 pack, RYA Yachtmaster Offshore, marine diesel engineering, and advanced open water diving licenses. He has sailed in locations such as Tahiti, Nova Scotia, The Florida Keys, Belize, Turks and Caicos, and The British Virgin Islands..
Born and raised in the Netherlands, sailing was an obvious but casual hobby for Folkert. In 2006 he turned his hobby into a fulltime profession. He began teaching sailing on the Solent on England’s south coast, and seasonal work took him all over Europe and the Caribbean. He spent a year in the British Virgin Islands, then went back to the Solent to teach there for two more years; and in between did a lot of deliveries in the Bay of Biscay, English Channel and Atlantic Ocean. 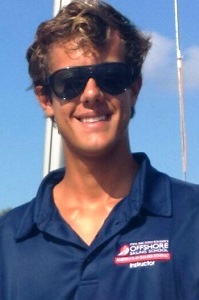 The BVI beckoned with sunshine, good wind, great people, and a great opportunity to work with Offshore Sailing School! Folkert holds Royal Yachting Association and US Sailing instructor certifications. He has been an instructor for three years, based in the British Virgin Islands, and took over as Caribbean Manager in May 2018. 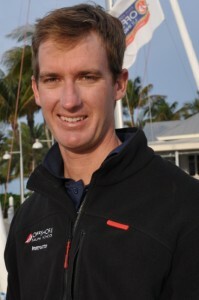 Warren and his wife, Katie Eyre, joined the Offshore Sailing School team in the spring of 2018. Warren has logged 96,000 nautical miles on a multitude of power and sailing yachts ranging from 40′ to 70’ in the United States, Central America, South American including Panama Canal transits; in the Caribbean and along the Intracoastal Waterway from Norfolk, Virginia to Miami. Born in South Africa, Warren has RYA Coastal and Offshore Skipper certifications from the Cruising Association of South Africa and all levels of ASA instructor certifications from Basic Keelboat to Advanced Coastal Cruising. In addition to delivering yachts worldwide, Warren has been a charter captain, sailing instructor, and charter yard maintenance in the British Virgin Islands, St. Vincent & The Grenadines. 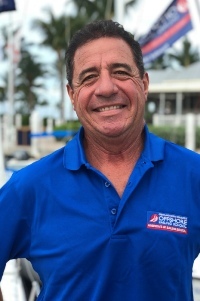 Warren is managing Offshore Sailing School’s largest branch location at South Seas Island Resort, with advanced sailing and racing experience on both monohuills and catamarans while captaining, delivering and teaching; plus vast experience maintaining and repairing sail and power vessels, as well as managing staff in the sailing/power yacht world. To say Katie is an avid sailor is a huge understatement. 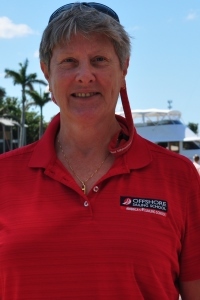 She and her husband, Warren Thring (Branch Manager at Captiva Island, Florida) have delivered many yachts together covering more than 34,000 miles since June 2015. Katie has taken the USCG Master 100 Ton Course with Auxiliary Sailing & Asst Towing Endorsements; has taken all levels of ASA courses, and seamanship and rigging course at Wooden Boat School. Her delivery experience has been on 40′-58’ sailing and power vessels in the Caribbean, along the eastern US coastline, ICW, Central and South America and Panama Canal Transit. She has raced in Antigua Sailing Week, BVI Spring Regatta, Rolex International St. Thomas and Lake Ontario 300 regattas – as spinnaker foredeck crew and jib trimmer. Katie is the ultimate people person, working alongside her husband, Warren Thring (see above), taking care of Offshore Sailing School clients at Offshore Sailing School’s largest location at South Seas Island Resort. Rick’s first experience at a sailing school was 40 years ago as a student in an Advanced Racing Program run by Offshore Sailing School at South Seas Plantation (now South Seas Island Resort) on Captiva, FL. The next year Rick went on to be the Lightning Fleet Champion at his local yacht club on Cape Cod. When he moved to Vermont he raced J-30s and J-24s on Lake Champlain for many years. In 2014 Rick sailed his Morgan 462 Ketch from Ft Myers Beach, FL to Cape Cod, MA and then back via the ICW, offshore and spent time sailing throughout the Bahamas. Since his retirement he has been splitting his time between yacht deliveries, captaining a Hanse 54 between Antigua and Boston via Puerto Rico, BVI, Ft Lauderdale, Cuba and many ports along the way. Rick honed his teaching skills as a high school soccer coach and Alpine ski racing coach and a member of the US Alpine Ski Coaches Association. 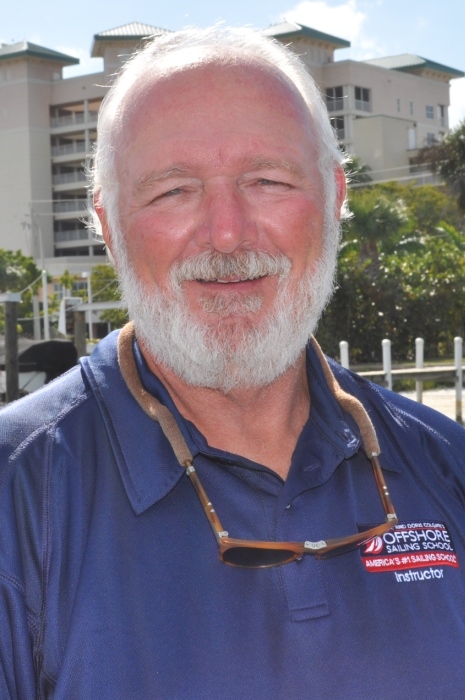 He holds a USCG 50 ton Master Captain’s License with both sailing and towing endorsements and is ASA instructor certified through Coastal Navigation. “I have sailed throughout the Caribbean, Bermuda, Antigua, the Abacos, Lake Champlain, coastal Maine, Cape Cod Bay, Long Island Sound and on and on. I have owned several power boats in addition to numerous sailboats and now I get to share my skill and knowledge teaching the subject I love most. What could be better?” says Rick. Kelly grew up in Texas and studied computer science in Colorado. He has taught live aboard courses extensively, sailed all over the Caribbean, Belize, Cozumel to San Pedro and the British Virgin Islands. For many years, Kelly raced Hobie Cats and ran a dive shop in the Florida Keys. He has a U.S. Coast Guard 50 ton license, US Sailing Basic Keelboat and Cruising instructor certifications, and is a PADI openwater scuba instructor. A recent transplant from California, Richard has been sailing the waters of San Francisco Bay and the Pacific West Coast for over 25 years. He holds a U.S. Coast Guard 100 Ton Master’s Credential with sail and towing endorsements; and has been teaching at the US Sailing school in San Francisco for over 10 years. As an avid single handed sailor he has logged thousands of ocean miles from Mexico to British Columbia. In addition, he raced across the Pacific in the Pacific Cup race from SF to Hawaii and the Newport-Ensenada race in Southern California. He has done a number of delivery trips of sailing yachts from 42 to 65 feet – Mexico to California, Tahiti to Easter Island, and Fiji to Sydney Australia among others. In addition, he gained unique experience as volunteer crew on a 125′ top sail schooner travelling from the Great Lakes, into the St. Lawrence seaway to the North Atlantic and finally into the Chesapeake Bay. A photo of Richard is coming soon. Before joining Offshore in 2013 Neil was senior instructor at UK’s Commodore Yachting, one of the largest sea schools on England’s south coast. He is a qualified Royal Yachting Association Yachtmaster Instructor and has many years’ experience as a sailing instructor teaching all levels, including working with private clients on larger yachts in the Mediterranean. He spent over a decade as Navigator in the Royal Air Force flying jets in excess of 500 miles per hour. Neil has a Bachelor of Arts degree in Architecture and when not sailing, he is an avid film enthusiast and spends his spare time writing thrillers. 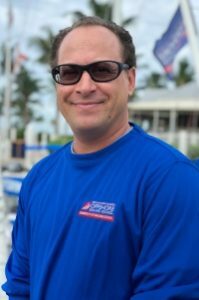 Rob joined the Offshore Sailing School team full-time in June of 2018 now that his two children, Devin and Cass, are grown and off on their own life adventures. 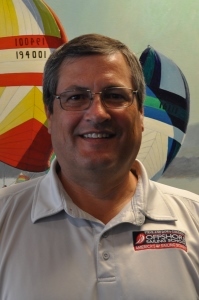 Born and raised in Chicago where he owned and operated a commercial construction and real estate management firm, Rob has been sailing the Great Lakes and inland waters since age 7. As an adult he traveled and sailed all over the world during Chicago winters, as captain and crew on sail and motor yachts ranging from 30’ to 70’ in the Mediterranean Sea, Atlantic Ocean, Caribbean Sea and the Gulf of Mexico. Rob is a USCG Masters-Licensed Captain, US Sailing Certified Instructor, holds NOLS/WMI and American Red Cross Medical Certifications, and lived aboard his own Dufour 405 for four years. He has also been a Wilderness/Adventure Expedition Leader and Outdoor Instructor for youth and adults; worked as a Charter Captain, Sailing Instructor, and Delivery Captain, and is skilled at all aspects of boat operations, maintenance and fleet management. Although always an avid sailor, Rob is also passionate about teaching/learning, experiential education, youth development and the environment. He genuinely loves working with people, and is very active in the community when not out on the water. 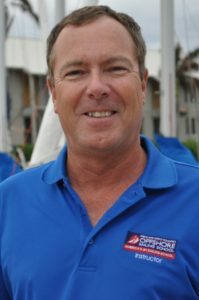 Steve joined Offshore Sailing School as an instructor in November 2014 after moving from California where he worked as a Sailing Instructor, Charter boat Captain, and manager of a Sailing School and Charter company. He holds a USCG Master Captain 100 ton license and is a US Sailing certified instructor. Steve has also worked as a Harbor Patrolman on Catalina Island. He sailed Southern California waters for 40 years, living aboard his Beneteau 473. Patrick holds all levels of US Sailing instructor Certification: Basic Keelboat, Basic, Cruising, Bareboat Cruising, Coastal Passage Making, Performance Sailing Catamarans, Power Boats and Coastal Navigation and has a US Coast Guard Master 50 Ton license. 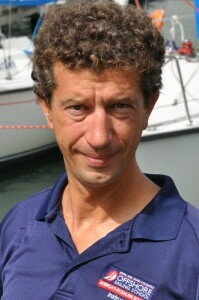 Born in France, Patrick spent several years teaching sailing in Brittany, then in Los Angeles and Seattle. 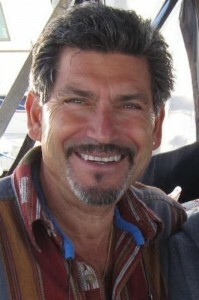 He has over 30 years of sailing experience, from small crafts to offshore cruising. Patrick was based at Captiva Island, Florida and is now teaching for Offshore Sailing School in the British Virgin Islands. Originally from Minnesota, Joelle spent 16 years of her adult life in Europe. An avid world traveler, she has raced and cruised the North Sea, Baltic, Mediterranean, Caribbean, Sydney Harbor, Whitsundays, Lake Superior and San Francisco Bay. In Brussels, she was Commodore of the Brussels International Sailing Club. 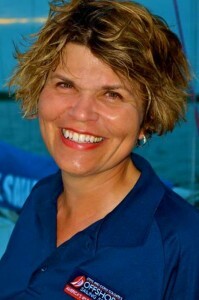 She holds US Sailing instructor certification, RYA Yachtmaster, RYA Cruising Instructor, STCW95 and U.S. Coast Guard credentials in addition to FAA Flight Instructor and a Commercial Pilot Certificates. Joelle speaks German as a second language. In her free time she enjoys sailing her Laser, flying seaplanes, playing the violin and SCUBA diving. 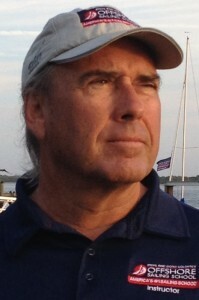 Lee was introduced to sailing by his Geology professor, and has been boating for over 40 years on power and sailboats. He has raced in Chicago to Mackinac, Port Huron to Mackinac, and SuperMac Races, in addition to many Queen’s Cups and club races. Lee has his Master 50 Ton Near-Coastal Captain’s License, was most recently an Instructor with US Captain’s Training in Traverse City, Michigan, and served as Captain at the Michigan Maritime Museum in South Haven, Michigan. Lee has a Master’s Degree in Education, has worked for schools, a “Big Four” consulting firm, two global manufacturing companies as a trainer, and as Executive Director of a mental health center. A photo of Lee is coming soon. Andy sailed for more than forty years on the great lakes, and has sailed in Florida since moving there in 2012. He has raced on various sailboats in a variety of races including several Port Huron to Mackinac Races and Chicago to Mackinac Races, as well as weekly sail club races. Andy has a degree in Mechanical Engineering and holds Marine Mechanic Certification. Clint hails from the northern California coast. He started sailing with family and friends on home built boats, Snarks, and Hobie Cats at the tender age of two. As he grew, so did his passion. His father’s move to Florida’s Gulf Coast afforded him the ability to experience larger yachts and open water, during his visits. When he was a junior in High School, he joined the Sea Scouts and over time, rose from crew to junior officer, then officer, while serving on the Compass Rose in San Francisco Bay. As an officer, he mentored and trained younger recruits in all aspects of seamanship. For his high school senior project, Clint built his first sailing pram. After college, he added to his knowledge of boat building, repairs, and mechanics by working for several yacht builders and boatyards. In 2009, Clint became a licensed Captain and soon began running commercial sailing craft on Florida’s nature coast. These days, the married father of three lives in Gulfport, Florida and enjoys teaching for Offshore Sailing School. When he isn’t sharing his love of sailing with his students, you might catch him giving salsa lessons! 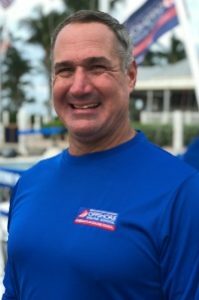 Born in the UK, Mark holds a U.S. Coast Guard Captain’s License, STCW95 Certification, US Sailing instructor certification and is a certified open water Scuba Diver. 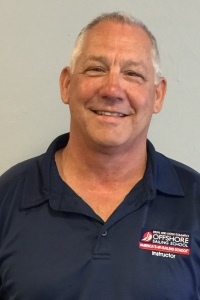 He moved to Fleet Service Director from Florida regional manager in 2013 and continues to enjoy sharing his passion for sailing with students when he is called to teach. Mark has sailed along the California coast, Florida Gulf, in the Atlantic, and Caribbean. In his free time, he cruises on his own boat, from Tampa Bay to the Florida Keys, and in the Caribbean. 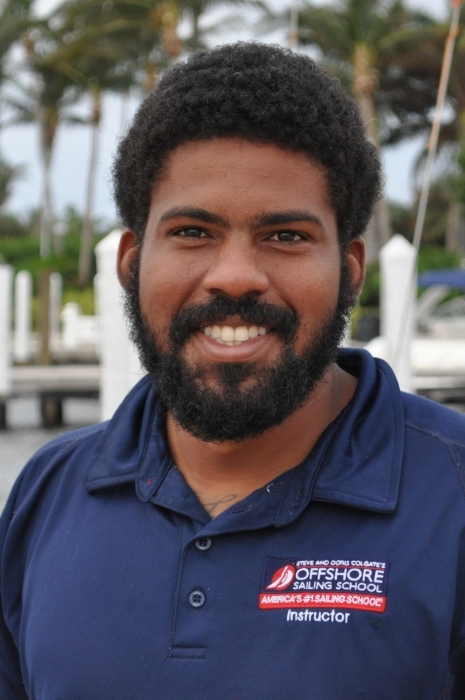 A Florida native, Brian has been a member of the Offshore Sailing School team since 2005. 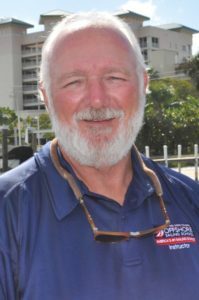 He started racing dinghies at 11 and has enjoyed sailing and power boating in Southwest Florida ever since. Brian graduated from the University of Florida, is a licensed U.S. Coast Guard Captain and certified US Sailing instructor. He teaches all Offshore Sailing School courses – from Learn to Sail, Performance Sailing and Racing, to cruising and passage making courses on monohulls and catamarans. He was manager of Captiva Island and Ft. Myers Beach, Florida campuses prior to moving to the British Virgin Islands, where he managed our Caribbean locations for four years. Brian is back in Florida as a full-time resident. Cheyenne Warner grew up on the island of Antigua where he started sailing when he was 3 years old. He learned on small boats at the local yacht club, and in his teens became a sailing instructor there. At 17 he was introduced to ocean racing, took Royal Yachting Association classes, and became a charter and delivery captain which led him to sailing all over the Caribbean, Europe and the United States. Cheyenne is a U.S. citizen and holds US Sailing Instructor Certification from Basic Keelboat, Cruising to Offshore Sailing; as well as a variety of Royal Yachting Association and Maritime Training Certificates. Key West’s warm weather and sailing lured Jeff from the Midwest where he learned to sail at the University of Michigan. In 1992 he got his U.S. Coast Guard Master’s license, and followed Caribbean breezes to St. Lucia to manage Offshore’s Windward Islands campus. 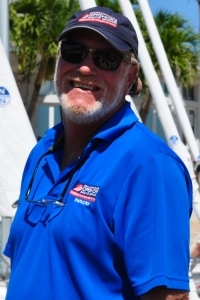 Jeff has done two Atlantic crossings under sail and worked professionally throughout the Western Mediterranean, Caribbean, Bahamas, and Eastern Seaboard, Gulf of Mexico and Great Lakes, operating private and charter motor and sailing yachts. 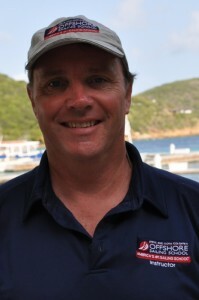 Jeff holds US Sailing instructor certification and is Offshore’s lead celestial navigation instructor. Jack grew up in North Carolina sailing Hobie cats, sunfish and Flying Scots. When he was seventeen years old he began working as a sailing instructor, teaching mostly children from ages seven to eighteen. He has been teaching, moving boats and racing seasonally ever since. Jack started working for Offshore after going to business school at the University of North Carolina. He holds a U.S. Coast Guard captain’s license and US Sailing Instructor certification.